High school and college students engage in various scholarly activities. A recent article in the American Journal of Kidney Diseases on hemorrhage risk and kidney function in patients on warfarin is unique as the first author was a high school student during the study period and is currently a college student. Mr. Mohit Limdi (ML) discusses his role as a very young author and researcher with Dr. Kenar Jhaveri (eAJKD), eAJKD Blog Editor. eAJKD: Please tell us where you are in your studies. ML: I’m currently a freshman at Georgia Institute of Technology. I want to do a bachelors degree in chemical and bio-molecular engineering. I started working on this project when I was at Altamount High School in Birmingham, Alabama. eAJKD: How did you get involved in this project with kidney disease patients? ML: I got involved in this research the summer before my sophomore year in high school. I was volunteering in a lab at the University of Alabama at Birmingham. The lead researcher, Dr. Nita Limdi, got me excited about and involved in warfarin-related studies. Additionally, Dr. Michael Allon, a nephrologist at the university, encouraged me to take this project further. He taught me about kidney disease as I shadowed him on rounds. The idea to do this particular project stemmed from discussions I had with him. Later, the University of Alabama at Birmingham Epidemiology Scholars Program allowed me to conduct this research successfully. eAJKD: What specifically made you excited about working with nephrology patients? ML: Going to dialysis units and seeing directly what these patients have to go through inspired me to do this research. I strongly believe in prevention, and hence got involved with Dr Allon on this venture. eAJKD: Nephrology is facing a major shortage of applicants going into the field. There are many possible reasons for this, but one is a lack of mentorship during medical school and residency. What role did your mentor have in inspiring you to pursue this project? ML: Dr. Allon became a driving force for me on this project. I agree that mentorship is extremely important for career choices and success. I am grateful for having such great mentors and hope to continue to have them as my career progresses. eAJKD: Do you think high school and college is a good time to get involved in meaningful research in medicine? What advice would you give other students your age? ML: If you are interested in science, getting involved in high school and college is a good idea. Regardless of the career path one chooses, such experiences are very enriching for young scholars. It exposes you to potentially unfamiliar career paths as well. eAJKD: Do you think that high school and college might also be a place to attract students into the field of nephrology, or might this be too early? ML: I definitely think that college would be a good place to engage students. It may be a bit too early in high school. When I talk to many of my friends who want to go to medical school, many don’t have an idea of what specialty they would like to pursue. In contrast, having early exposure might give one some knowledge of what nephrology means and what “kidney disease” entails. Also, getting involved in research can help you understand what scientists do to advance many fields in medicine. Strong mentorship and dedication from physicians and scientists need to be available to successfully allow high school students to embark on such journeys. eAJKD: Are you aware of Kidney Disease Screening and Awareness Program (KDSAP)? It utilizes college and high school volunteers to increase awareness of kidney disease. What do you think of such ventures to draw students towards nephrology? ML: Yes, I have visited their website. I think it’s a fantastic opportunity for students to increase their awareness of kidney disease. I would definitely like to get involved if a local chapter was available. 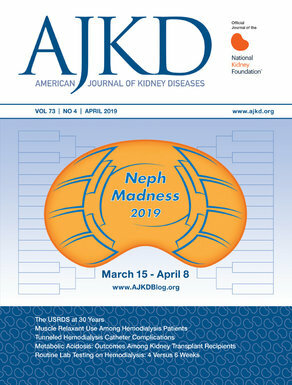 eAJKD: Do you have suggestions on how to increase interest in nephrology? ML: 1. Show students real-world problems. Show them what living with kidney disease means and allow that to spark their interest. 2. Provide them with meaningful mentored experiences in the science of nephrology. 3. Make them realize how they can make a difference in patients’ lives. To view the article (freely available), please visit AJKD.org.